What a week, fashion week just passed by and I´m feeling a little like a zombie, working out all these postings and upcoming articles for my reviews. As much as I love my job, it can be so exhausting but that’s passion I guess. So, after this moaning introduction, I want to share some other great news with you, as a bunch of trips is coming ahead and even better, the next one will be this weekend.. The past week was great by the way. Don’t worry if you missed my stories on Instagram, you can re-watch my adventures in my story highlights and a few new outfit posts are in the line as well. This season I really felt like I found my style again. Being packed with nothing more than a few dresses and shorts during my long-term travels made me super lazy and lacking in creativity. When I was younger I always dressed up so much during fashion week but a few years ago I finally realized that fashion week is not necessarily an event to fake a certain style but express yourself while wearing the looks one would also wear in real-life. I listened to myself, looked through my wardrobe and last year I really selected my favorite pieces to keep and those which I think match the style and message I want to express, rather than being a fashion victim. This outfit was taken on the first day of fashion week and you might discovered the bright yellow seating card of the fashion show I was watching that day. The label AMESH had its debut during Berlin fashion week and was sponsored and invited by Mercedes Benz for this special occasion. The designer from Sri Lanka really caught my eyes and heart with those wonderful pieces and “shop the runway” has never been so suitable. If you don’t know the designer yet, give it a shot and ask google for more, trust me – you´ll love it too! What I love most about this look is that it is truly matching my passion for Japan. 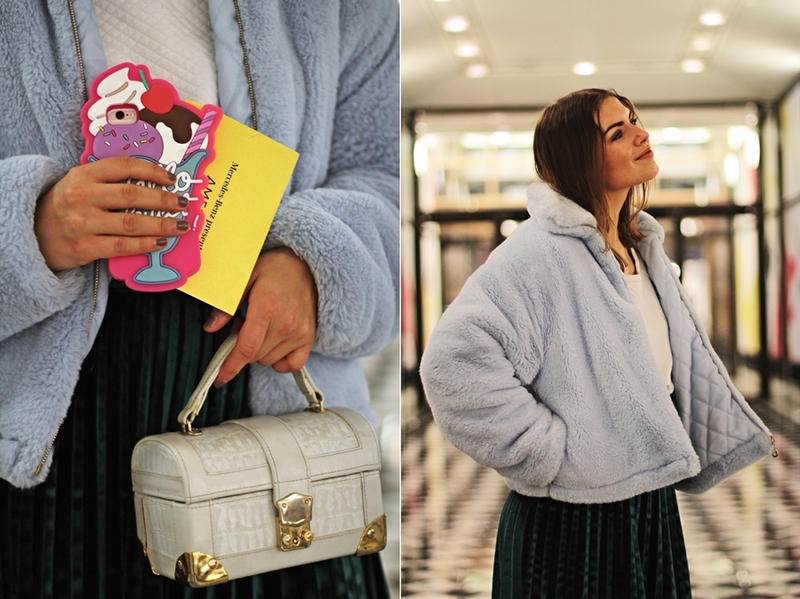 The huge milkshake phone cover is from Japan, while the blue fluffy jacket is the fashionable definition of kawaii. 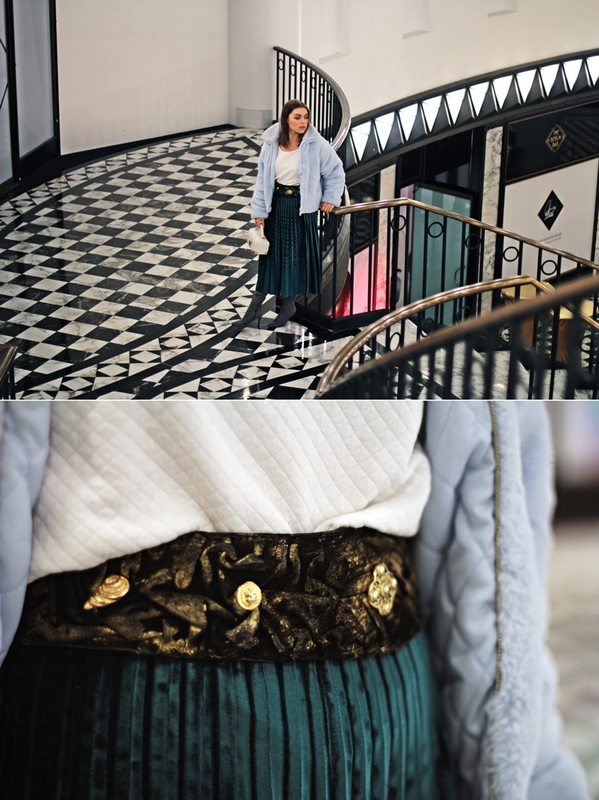 As I´m a huge fan of color blocking I added a green velvet skirt and some contrasts, like the white sweater to keep me warm and the grey over knees, which are giving such a good match to the whole look. For those who read my blog for a while already, you guys know how much I used to love vintage. 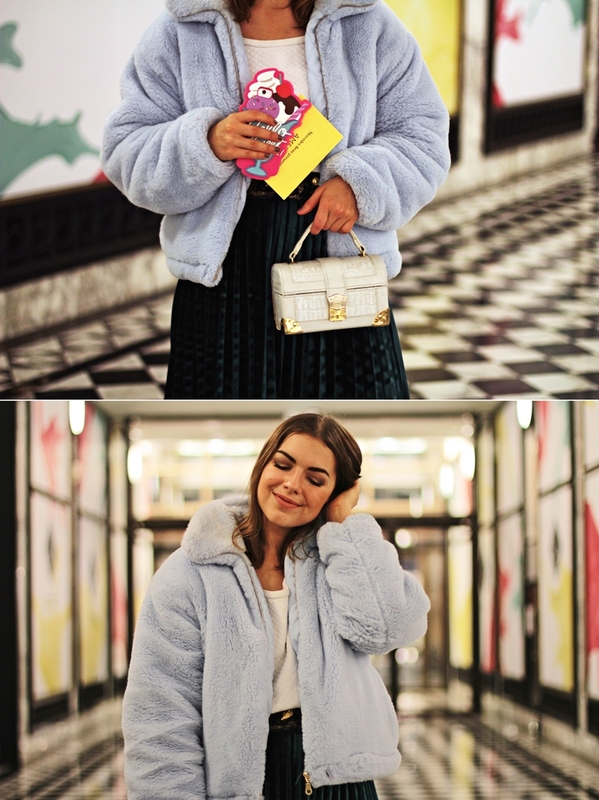 My whole wardrobe was just vintage pieces and this bag is one of the best pieces of them all and a powerful addition to make it a strong, independent look, just like the waist belt, which my mom used to wear when she was my age. With those sleek, ironed hair and the popping accessories, I didn’t see a need for more accessoires like earrings, as the look was already that strong and I didn’t want to end up like a Christmas tree (ok, too much of a good laughter?). Anyways, I´m definitely up to wear this combo more often in future. For those who still remember the first lines of this post: my trip this weekend will be in Austria, more specific in Salzburger Land, where I have headed to last year for a fun weekend with a helicopter flight and some snowy adventures. You guys can see my previous article by clicking HERE.